"The most powerful country on earth cannot afford to be consumed by fear. To make war on terrorism the centerpiece of our national strategy is an abdication of our responsibility as the leading nation of the world. The United States is the only country that can take the lead in addressing problems that require collective action: preserving peace, assuring economic progress, protecting the environment, and so on. Fighting terrorism and controlling weapons of mass destruction also fall into this category. The United States cannot do whatever it wants, but nothing much can be done in the way of international cooperation without the leadership or at least active participation of our nation. The United States has a greater degree of discretion in deciding what shape the world should take than anybody else. Other countries have to respond to U.S. policy, but we can choose the policy to which other states have to respond. This imposes a unique responsibility on the United States: Our nation must concern itself with the well being of the world. We will be the greatest beneficiaries if we do so." This compilation of statements by some of the leading non-proliferation experts/research institutions tries to elucidate some of the serious monitoring problems. These problems have created an information vacuum that states or terrorist organizations may seize upon to threaten (or bluff with threatening) the use of weapons of mass destruction, as Saddam Hussein chose to do. A publication of the Institute for Science and International Security. "The historical application of verification has been uneven. It is evident that the verification regimes established to date are imperfect, and that states can cheat on their obligations without being caught. On the other hand, the lessons of failure can inform efforts to improve verification. For example, Iraq's successful ability to cheat on its Nuclear Non-Proliferation Treaty (NPT) obligations and evade full-scope safeguards led to the improvement of the safeguards regime. Some verification regimes have yet to be fully tested. The strengthened International Atomic Energy Agency (IAEA) safeguards regime is not in force in many countries where cheating is suspected. "The use of national technical means (NTM) -which played a major role in convincing the IAEA to be persistent in the North Korean case- will complicate a cheater's efforts to hide its activities." "The lesson of these experiences is that verification organizations must understand and clearly communicate their own limitations. The Agency [IAEA], in particular, has had difficulty historically in admitting its own problems." "Even when a state is transparent, it may be difficult to draw conclusions. For example, there was little doubt about the honesty, openness, transparency, and cooperation shown by South African officials and nuclear weapon scientists towards special IAEA investigators. However, it took a long time and a team of highly skilled and knowledgeable inspectors to arrive at a positive conclusion that South Africa had fully dismantled its nuclear weapons and accounted for its nuclear-explosive materials. Where a state is not transparent, it is appropriate for the verification agency to be skeptical. When North Korea refused to allow the IAEA to conduct a special inspection, the Agency -correctly- pronounced North Korea to be in noncompliance with its safeguards obligations. By extension, North Korea's compliance with its NPT obligations was cast in doubt." "Political Support for Verification Activities is Imperative: The history of verification shows that, even under the most technically rigorous verification regime, political support by the international community is vital. If a verification regime lacks support, it will fail." 1 President, 2 Director, Institute for Science and International Security. "The Challenges of Fissile Material Control"
Institute for Science and International Security Press, 1999. A unique, across-the-board critique of the ways in which plutonium and highly enriched uranium (HEU), or "fissile materials," are managed in both civil and military programs. "The report identifies and evaluates 19 separate policy objectives and awards letter grades ("A" through "F") to each objective. According to the report, 'this approach offers a coherent and realistic vision of how the international community is addressing the threats posed by inadequately controlled fissile materials, and can identify those controls that are the most urgently in need of improvement.'" "Overall, the report concluded that fissile material control efforts deserve a grade of "C", "an uninspiring mark given the threat posed by these materials and the expectations of the early 1990s" that controls would proceed more rapidly. The report awarded its highest grade, an "A-", to unilateral initiatives by the five recognized nuclear weapon states to end the production of fissile materials for weapons. Efforts by the International Atomic Energy Agency (IAEA) to strengthen its safeguards in the non-weapon states also received an "A-". A failing grade of "F" was awarded to efforts to establish acceptable nuclear waste repositories." Safeguards supporters have also criticized the goals, but for different reasons. They contend that detection goals, even when understood, are in some instances unattainable, and their continued use weakens confidence in safeguards generally. The detection goal of one explosive-significant quantity (SQ) is considered unrealistic because in certain facilities (such as large-scale bulk handling plants) measurement error alone theoretically could exceed the proposed detection goal by an order of magnitude. From this point of view, and even if that theoretical high is not reached, the notion of allocating limited safeguards resources to try to bring diversion detection down to one significant quantity could cause a very severe drain on those resources and still not give absolute assurance over a long period of time that a significant quantity of material has not been diverted without detection, since there will always be some measurement error. Henry D. Sokolski (ed.) 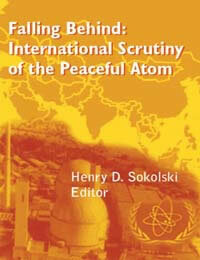 Falling Behind: International Scrutiny of the Peaceful Atom, full report (pdf, 355 pages), Strategic Studies Institute - United States Army War College, February 27, 2008 (in cache, February 3, 2011). Chapter 1: Henry D. Sokolski "Assessing the IAEA's Abiity to Verify the NPT"
fuel processing plants utilizing nuclear materials directly useable to make bombs). For some of these plants, the agency loses track of many nuclear weapons-worth of material every year. Meanwhile, the IAEA is unable to prevent the overnight conversion of centrifuge enrichment and plutonium reprocessing plants into nuclear bomb-material factories. As the number of these facilities increases, the ability of the agency to fulfill its material accountancy mission dangerously erodes. The IAEA has yet to concede these points by admitting that although it can monitor these dangerous nuclear activities, it cannot actually do so in a manner that can assure timely detection of a possible military diversion - the key to an inspection procedure being a safeguard against military diversions. Chapter 5: Edwin S. Lyman "Can Nuclear Fuel Production in Iran and Elsewhere be Safeguarded Against Diversion?" [Dr. Marvin] Miller [Massachusetts Institute of Technology, in "Are IAEA Safeguards on Bulk-Handling Facilities Effective? ", Nuclear Control Institute, Washington, DC, USA, 1990] observed that for large bulk handling facilities, such as the 800 metric ton heavy metal (MTHM)/year Rokkasho Reprocessing Plant (RRP) now undergoing startup testing in Japan, it was not possible with the technologies and practices available at the time to detect the diversion of 8 kilograms of plutonium (1 significant quantity, SQ) - about 0.1 percent of the annual plutonium throughput - with a high degree of confidence. This is because the errors in material accountancy measurements at reprocessing plants were typically on the order of 1 percent -that is, a factor of 10 greater than an SQ. If after taking a physical inventory, the value of plutonium measured was less than expected (on the basis of operator records) by an amount on the order of 1 SQ, it would be difficult to state with high confidence that this shortfall, known as "material unaccounted for" or MUF, was due to an actual diversion and not merely measurement error. in which sigma is the relative uncertainty in measurements of the plant's inputs and outputs, and A is the facility's plutonium throughput in between periodic physical inventories. This formula is derived from a requirement that the alarm threshold for diversion be set at a confidence level of 95 percent and a false alarm rate of 5 percent. the value of E would be 246 kilograms of plutonium, or more than 30 SQs, if physical inventories were carried out on an annual basis, as was (and is) standard practice. This means that a diversion of plutonium would have to exceed this value before one could conclude with 95 percent certainty that a diversion had occurred, and that the measured shortfall was not due to measurement error. Joachim Gruber, Reactor plutonium bomb: Pu generation in a LWR. A Light Water Reactor power economy lacks proliferation resistence. Currently (October 2003) Dr. David Kay is a Senior Fellow at the Potomac Institute for Policy Studies with a concentration on counterterrorism and homeland security issues. He was the team leader for three IAEA inspections in Iraq. adapted from a transcript of a talk given for the Program of Nonproliferation Studies at the Monterey Institute of International Studies on February 10, 1993. "Saddam Hussein turned to the individual who eventually became the scientific head of the Iraqi program, Jaffar Dhia Jaffar, and said, "Dr. Jaffar, if we stay in the NPT [Nuclear Non-Proliferation Treaty, monitored by the International Atomic Energy Agency, IAEA], will it in any way hinder the clandestine nuclear program?" Jaffar says his answer was an immediate and unequivocal no; he said it would have absolutely no effect upon Iraq's program. That is one of the most important lessons to learn. If anything has to make tomorrow different from today, and all other days previous, it has to be that governments that are trying to make a similar decision (that is, if we stay in the NPT, will it make a difference) have to not be able to reach such an absolute conclusion with such assurance. The Iraqis did reach this conclusion, and Iraq went ahead and developed an enormous program." "... The Iraqis also had in place three major uranium enrichment programs: a calutron program (the original method used by the US, which was also used by the Soviet Union, Britain, Japan and the PRC); a gas centrifuge program, which acquired or built enough parts for at least 10,000 gas centrifuges, which is a huge number; and a chemical enrichment program. They also did a significant amount of research on gaseous diffusion, laser enrichment and jet nozzle enrichment as well. " "... A team of modern weapons designers that looked at them remarked on how primitive they were, but we had the people who had worked in the US and British programs in the early days of the programs look at them as well. We asked them to baseline the Iraqi codes against codes that were used in the 1950s and 1960s. The codes that the Iraqis used are freely available - they run on PCs - and they are much, much better than the codes that were available to weapons scientists then." "... there is a rising level of technological wealth and managerial skill. Let me stress the last part, managerial skill. The Iraqis defeated the export control regimes, not because of the ineptness of the regimes or because of corruption, but because they learned that they did not have to buy a final assembled instrument with everything they wanted. If they could buy it in parts from three different countries and had the proper project management skills, they could put it together themselves. In fact, if you want to look at scientific talent in developing countries, the most important talent for a nuclear program is not physicists. In fact, the Iraqi program would have gone a lot better is they had locked the physicists up (because they spent too much time thinking about better ways to do things). It is the mechanical engineers, electrical engineers, chemical engineers, project management types that make a difference. Even in countries that we look at as being poor and disorganized, these types of engineers are there in large numbers, and there may be some sectors that are very, very advanced." "... they [the Iraqis] had learned to defeat national technical means (NTM), i.e., signal and satellite intelligence. "... The photo interpreters had looked at it and didn't believe that it was a major site because it had no security fences around it, no anti-aircraft around it, and no electrical power going into it. It looked like another one of the industrial complexes you find a lot around Baghdad. "... People do not have to get on a plane and fly to point A. All they have to do is plug a Macintosh in with a modem and they can work any place in the world. A lot of the data exchange on the centrifuge program into Iraq did not come from people going to Iraq. It was done in other places. This also makes it much harder to track and identify, since people aren't necessarily flying into countries where they shouldn't be. " "... Don't tell me you can't rat on people who have been your friends. They charge you, you pay a risk premium, and everyone knows that you pay a risk premium because there's a risk that the supplier will be exposed. Go ahead and tell us." Instead, Jaffar pulled out the invoice (without the supplier's name on it) and, sure enough, they had only paid a couple of cents per pound over the world market price for maraging steel. That tells you that for a lot of commodities there is, in fact, not much of a risk. And, maraging steel is one of the more strictly controlled. That is something you have really got to worry about. Material does get out and will continue to get out. " "... The material presents another risk. Somewhere in the order of 4 kg to 12 kg of plutonium is sufficient for a nuclear device. That is an amount that is smaller than an American softball, if it were in a single source. If you look at how drugs are moved around the world, you realize the problem of preventing the transfer of small amounts of material. There are ways to smuggle this material that are not technically difficult. " "... If Iraq had not invaded Kuwait when it did in 1990, but if it had waited until 1994, not only would Iraq have had a nuclear weapon,..."
"... I'm afraid that unless steps are taken in 1995 at the NPT Review Conference, and unless other steps are taken soon, we will see a number of states start exploring the nuclear weapon option again, and this time it is going to be different. They can do all the non-nuclear work essentially out in the open. And they only have to worry about the acquisition of special nuclear material at the very last stage and that, for a series of technical reasons, is not going to be very difficult to do. Those things working together, in addition to what Iraq already taught us, mean that for proliferation we are entering a period far more dangerous than anything we have seen before, at least in the last thirty years. And that is really an optimistic view to conclude all of this. " Graham Allison is author of "Nuclear Terrorism: The Ultimate Preventable Catastrophy". II. 1 "Monitoring And Verification in a Noncooperative Environment: Lessons From the U.N. Experience in Iraq", Monterey Institute of International Studies, The Nonproliferation Review: Spring-Summer 1996, Volume 3 - Number 3. A multilateral inspection regime can be effective only to the extent that it is coupled with accurate and timely intelligence. Only one agency should be asigned all aspects of an international inspection regime. Effective verification cannot be based on periodic on-site inspections alone, but requires the integration of data from a wide variety of sources to monitor patterns of host-country activity over an extended period of time. II. 2 Verification Provisions of the Chemical Weapons Convention and Their Relevance to the Biological Weapons Convention, an analysis of the applicability of the CWC verification measures to a prospective BWC protocol". For theses reasons, the threshold for militarily significant cheating, or "treaty breakout", is considerably lower for the BWC than for the CWC. Finally, the ambiguities between offensive and defensive research on infectious agents and the lack of well-defined indicators of biological or toxin production make it more difficult to distinguish between "treaty-prohibited" and "treaty-permitted" activities at dual-capable biological facilities. For this reason, assessing intent is as important as physical evidence in determining BWC compliance. Table 3 describes the differences between chemical and biological weapons and shows where these differences complicate BWC compliannce monitoring." information sharing needed to identify clandestine programs. declare their acceptance and adoption of the Zangger Committee's trigger list as the minimum standard for implementing the export controls required by Article III of the treaty. notify the International Atomic Energy Agency (IAEA) in the form of an information circular that they will not export certain items³the same items in the trigger list³unless they are under safeguards. The United States, Japan, the European Union, Canada, and the Organization for Security and Cooperation in Europe has a number of programs to assist the implementation of export controls (e.g. exchanging information on export regulations and the process of deciding whether to grant an export license, and the training of customs officials to spot controlled items). [At the 2004 Prepcom] Germany made a proposal suggested that the IAEA, using experts from member states, could confidentially assess a country's export controls and make recommendations for improvement ... [T]he IAEA's International Physical Protection Advisory Service (IPPAS) [would] assist states in assessing their physical protection system. The program could be justified to help states implement their obligation to report trigger list transfers under the Additional Protocol. ... Because UNSCR 1540 does not set specific standards for what a state's export control system should look like, a neutral international organization could fill that role. IAEA Director General Mohamed el Baradei said in a January 2004 interview with Der Spiegel, –export controls must be dramatically improved and, in contrast to the past, must be carried out within an international framework". The Zangger Committee was formed in 1971, soon after the NPT entered into force, by a small group of nuclear supplier states that were party to the NPT. It was origianlly known as the NPT exporters committee, and its self-imposed mandate was to interpret Article III, paragraph 2, of the treaty, specifically to determine what equipment should be controlled. The committee agreed to a "Trigger List" of items whose export would trigger IAEA safeguards, just as would the export of source or special fissionable material. The United Nations Security Council adopted Resolution 1540 (UNSCR 1540) in April 2004, in the wake of the public exposure of the A.Q. Khan network. Though it explicitly focuses on the threat posed by non-state actors, UNSCR 1540 is the first measure to hold all states accountable for their export controls. Because the resolution is explicitly based on Chapter VII of the UN Charter, it implicitly carries the threat of UNSC sanctions or military force in cases of noncompliance. The resolution calls on all states to refrain from any form of support to non-state actors to acquire, develop, manufacture, transport, transfer, or use nuclear, chemical or biological weapons. Operative paragraph 3 requires all states to establish effective border controls and law enforcement to prevent the illicit trafficking of such items and to have "effective national export and transshipment controls over such items." The resolution recognizes the use of national control lists, but does not specify what items should be covered. The resolution could be read to include any item, if it were to be used by a non-state actor to make, use, or transfer a weapon of mass destruction. This lack of specificity leaves an opening for differing interpretations based on circumstances and could make enforcement difficult. "The Separative Work Unit or SWU is a measure of the work expended during an enrichment process. The aim of an enrichment process is to increase the concentration ("enrich") of one or more isotopes in a multi-isotope element. For uranium, a typical enrichment process consists of a number of centrifuges arranged in the form of a cascade (a number of separating centrifuges arranged in parallel and in series). V(x) = (2x-1)ln(x/(1-x)) where x is a given concentration (enrichment)." 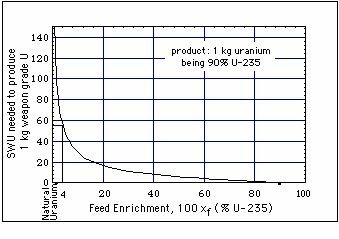 more ... Separative Work Units (kg) necessary to produce 1 kg uranium being 90% U-235 (weapons grade) as a function of initial ("feed") enrichment when the waste stream is 0.5% enriched in U-235. 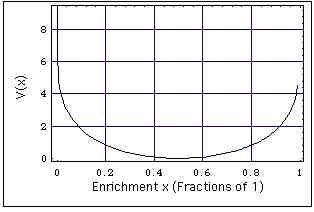 Enrichment of 4% enriched uranium (Light Water Reactor fuel grade) to 90% requires 55 kg SWU. Enrichment of natural uranium to 90% requires 155 kg SWU. "The bottom line - Light Water Reactors no longer should be given to any nation that might divert the reactor's fresh lightly enriched fuel. ... building and operating small, covert reprocessing and enrichment facilities are now far easier than they were portrayed to be 25 years ago." "A key reason why is the increasing availability of advanced centrifuge enrichment technology. This allows nations to make weapons-grade uranium with far less energy and in far less space than was required with older enrichment methods. It also allows them to distribute and hide their uranium enrichment facilities among a number of sites, something traditional gaseous diffusion uranium enrichment (the next most popular way to enrich uranium) does not permit." ... and might well do so "without [IAEA] detection in a timely fashion."